This is the final installment of a four part series on the final Skylab mission. Follow the link to Catch up on Part 1, Part 2, and Part 3. Forty years ago, in November 1973, NASA launched its third and final crew to the Skylab space station. As recounted in last week’s history articles, Commander Gerry Carr, Science Pilot Ed Gibson,and Pilot Bill Pogue were tasked to complete a mission of at least 60 days, open-ended to 84 days, either of which would produce a new world endurance record. The enormous success of Skylab’s first and second crews—who repaired and revived the crippled station, then went on to accomplish 150 percent of their science goals—imbued NASA with a false sense of confidence that it could fully load the final crew with an excessive amount of work. As circumstances would transpire, the experience of Carr, Gibson, and Pogue would teach the agency to regard long-duration spaceflight in a quite different manner to its earlier, shorter-duration missions. 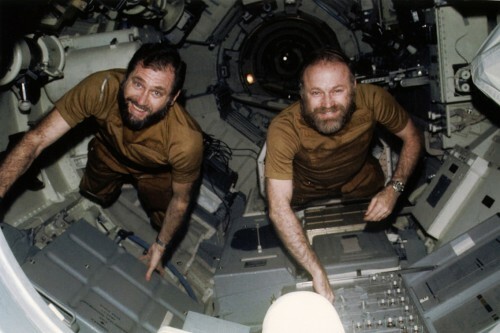 Whilst Ed Gibson elected not to grow a beard during his mission, his two crewmates, Bill Pogue (left) and Gerry Carr opted for the “Hairy Monster” look (Credits: NASA). 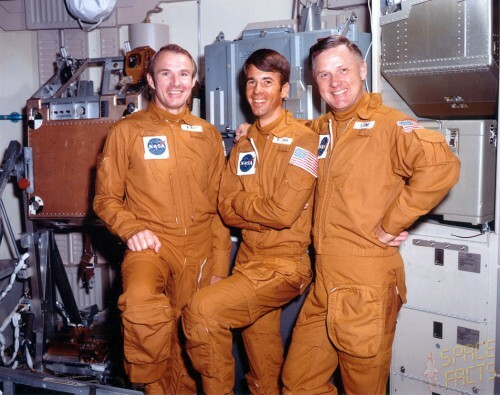 Astronauts Vance Brand, Bill Lenoir, and Don Lind served as backups for both the second and third Skylab crews and might have flown the 21-day fourth mission, had it been approved (Credits: NASA). It was a dramatic change and remarkable turnaround from the exhausted trio of spacefarers who had struggled to keep up with the timeline a few weeks earlier. Another extension pushed their mission to 70 days, with splashdown rescheduled for no earlier than 24 January, then further into the first week of February, and finally settling on the 8th. “The last six weeks of the flight were very pleasant for me for two reasons,” Bill Pogue remembered in his NASA oral history. “One, we’d achieved the skill level sufficient to do the job quickly and accurately, and second, I no longer suffered from the head congestion that had plagued me for about the first six weeks.” As they neared the 12-week limit, Pogue even hinted that NASA Administrator Jim Fletcher wanted them to spend anadditional 10 days aloft, but mentally the crew were ready to come home and, besides, the consumables aboard the workshop were almost exhausted.A potential fourth Skylab visit, lasting three weeks and possibly crewed by Vance Brand, Bill Lenoir, and Don Lind, was unlikely to ever take place. It had been considered as an option early in the spring of 1973, but, according to spaceflight historian Dave Shayler in his book Skylab: America’s Space Station, “proceeded no further than coffee-table discussions.” Had it flown, one of its primary functions would have been to mothball the workshop and perhaps conduct a few more experiments. However, the extension of Carr’s mission by a month past its original 56-day mandate sufficiently maximized the scientific return from Skylab and eliminated the need to launch a costly additional flight. On 3 February 1974, Carr and Gibson performed the final EVA from the station, retrieving the last of the film from the Apollo Telescope Mount (ATM) and gathering other material samples for return to Earth and subsequent analysis. In the beautifully calm waters of the Pacific, the command module of the final Skylab crew bobs gently after 84 days in space. (Credits: Joachim Becker/SpaceFacts.de). Splashdown, when it finally came, was into a thankfully calm sea, with virtually no wind, although the command module quickly assumed the inverted “Stable 2″ position. Within moments, though, the flotation bags around the spacecraft’s apex inflated and bobbed it over into the Stable 1 configuration required for the recovery operation. Helicopters hovered nearby and frogmen were soon in attendance. 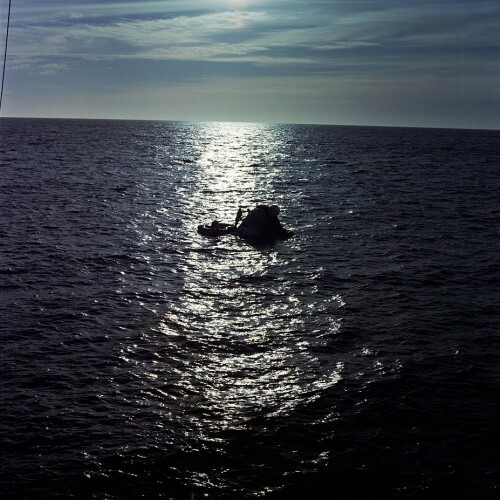 Dawn had barely broken in the Pacific and the final Skylab crew were safely home. They had left Earth as NASA’s first team of rookie spacefarers in almost a decade … and had returned as world record-holders, having jointly secured an impressive mission of 84 days since their November liftoff. None of them felt seasick, although the sensation of weight was strong; Gibson could feel his head on his shoulders and it took great effort simply to move his arms, but all three men could be thankful and deeply satisfied that their long mission had ended in fine fashion.As circumstances transpired, no shuttle visit to Skylab ever took place, although plans were afoot to conduct one. Delays in the development of the reusable spacecraft, and an unexpectedly fierce bout of solar activity, conspired to bring Skylab back into the atmosphere in a largely uncontrolled re-entry in July 1979. And thus ended America’s first foray into the space station business. Skylab had proven a tremendous success and, in some minds, a wasted opportunity, for its potential applications alongside the shuttle in the 1980s and as the basis for an “earlier” International Space Station could have been profound. Feature image: Spectacular view of Skylab, as seen from the departing crew of Gerry Carr, Ed Gibson, and Bill Pogue on 8 February 1974. This would be the last occasion that Skylab was ever seen, up close, by human eyes (Credits: NASA).